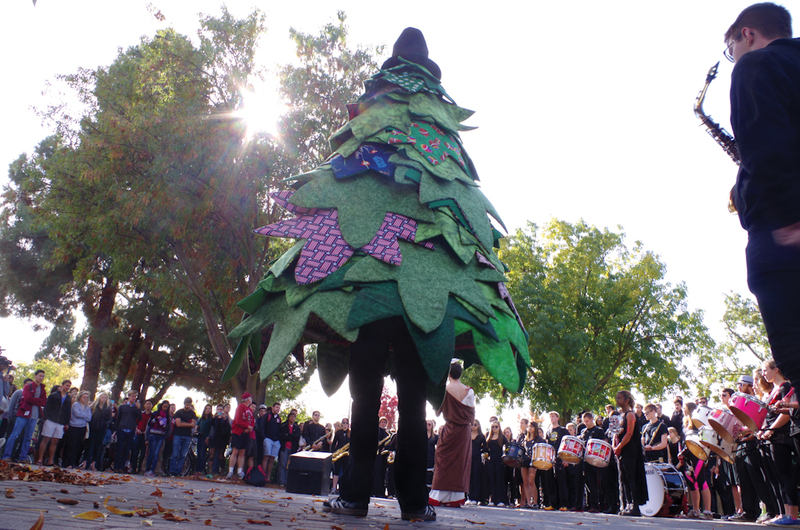 Dressed in black, the Leland Stanford Junior University Marching Band (LSJUMB) walked slowly toward the Claw, holding a wooden casket containing a lifeless stuffed bear. 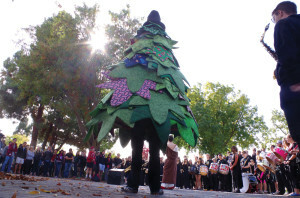 The band members were on their way to the Bearial, a funeral for the Cal bear mascot, Oski. After a eulogy filled with laughs and a recitation of a satirical tale of the origins of the Cal and Stanford rivalry—and how Stanford is obviously better—the bear was impaled on the highest peak of the fountain, warm red dye spluttering out of its defeated heart. “It’s a fun little thing we do to kick off Big Game Week,” said Ellen Kettler ‘15, public relations officer for the LSJUMB. Kettler added that in past years the Bearial has had themes, including the signing of the Declaration of Independence and “Lord of the Rings,” with a team of writers composing a unique eulogy for the Berkeley mascot. Roughly 80 to 100 people witnessed the Bearial this year, according to Kettler. The bear will remain impaled on the Claw until the end of the week.